Ambient Tape Machines: C1 was created by first capturing 3 unique raw sets of samples, recording them onto cassette tape, and then playing them back at full and half speed on a vintage Library Of Congress C1 cassette player. Analog tape helps give music a certain warmth that is hard to emulate in the digital world, and playing back sounds at half speed on tape is a truly incredible experience. 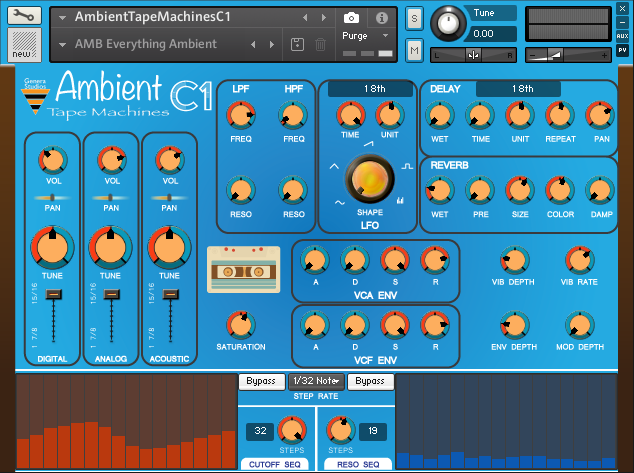 Ambient Tape Machines: C1 allows you to blend and control these lush sounds so you can sculpt the perfect ambient soundscape. • Open script for all you KSP scripters out there! • Requirements: Native Instruments Kontakt 5.8.1+ or higher. The Library of Congress C1 Cassette player is a vintage piece of gear originally intended for the vision impaired to listen to audio books from the Library of Congress. Its unique variable speed playback controls make it a very powerful ambient sound creation tool. The unit used in this instrument seems to introduce a slight slow-down, some noise, and some wobbling at half speed – giving these samples a truly unique sonic fingerprint. To reduce the noise the samples were de-noised using industry standard tools, but to maintain the integrity of the raw sound we purposefully left some noise in. The samples were tuned in Kontakt to counter the slight slow-down effect of the tape machine. There are 3 unique raw sample sets in Ambient Tape Machines: C1. These are broken down by Digital, Analog, and Acoustic. The Digital sound was produced using a modern digital synthesizer performing virtual analog synthesis. The Analog sound was captured from a 3 oscillator analog mono-synth set on a huge/ambient patch. The Acoustic sound was captured from an electric guitar playing palm muted notes through a clean patch on an Axe-FX II XL+ with some very lush shimmer reverb applied. Through the GUI you will be able to change the play back speed between full and half, tune them, set the volume, and pan each of the sounds individually. Each sound is incredibly detailed on its own, but the real magic happens when you blend them together in creative ways. To show you the potential of what Ambient Tape Machines C1 can do, we teamed up with two excellent musicians and sound designers to create over 70 presets. Jetfire Prime and Franklin Vanderhyde contributed incredible patches that compliment the patches we came up with, and pushed the instrument into new sonic landscapes we never thought of. This was primarily an ambient instrument, but you can also create more traditional lead, bass, and synth patches. 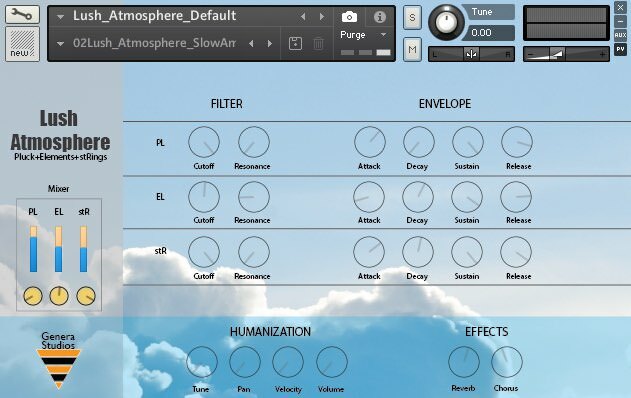 Lush Atmosphere is an ambient Kontakt Library featuring 3 ambient instruments, and a master patch to mix and control them. Lush Atmosphere will be the secret sauce you throw in your mixes to add that lush ethereal sound. 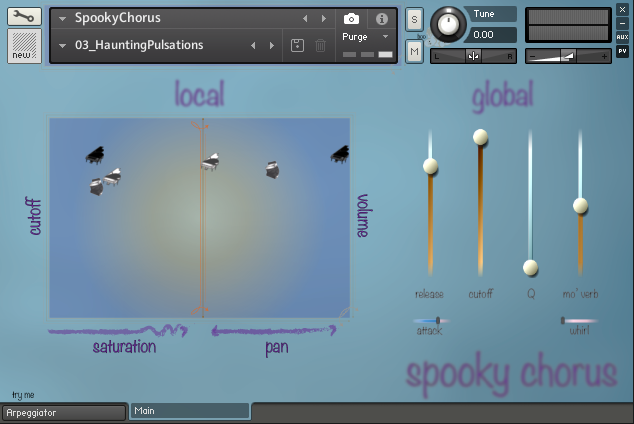 Spooky Chorus is Kontakt Instrument created by making convolution IR responses out of vocal notes, and then routing noise through each sample to make an atmospheric choir sound. As a second set of sounds, the original samples were then fed through a shimmer reverb to create an even more atmospheric sound. As a third set of sounds, a spooky transient layer was added. The GUI of Spooky Chorus was designed to be very graphical. It can be divided into two categories: local and global. The local parameters are made up of 2 XY Pads so the user can graphically place the instrument in both space and frequency. The global parameters are made up of traditional sliders. A second tabbed page gives arpeggiator controls. Our mission with Spooky Chorus was to minimize the amount of knobs and sliders without losing any control. The bulk of the UI is made up of 2 XY pads, each containing the 3 unique sounds. You can drag around the sounds on the Volume / Pan Pad to position the instrument in space, and then drag the sounds on the Cutoff/Saturation Pad to position the instrument in frequency content. The remaining sliders control the global parameters of the instrument in a more traditional manner. 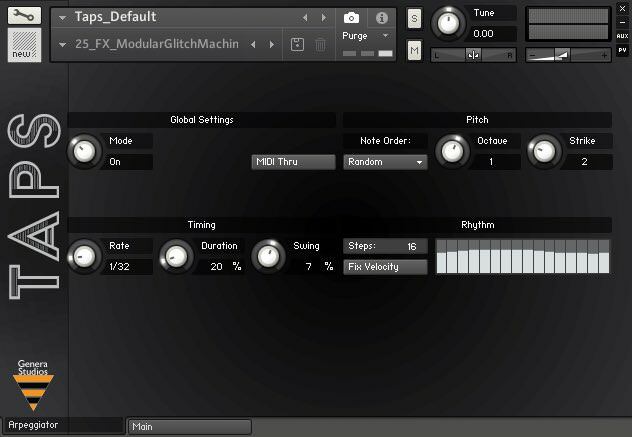 Spooky Chorus comes with a second tab on the GUI that gives you access to an arpeggiator. This is a stock NI preset arpeggiator, but it gives you access to a completely different way to play the instrument. Our favorite mode is random, with the rate set to high speeds – this creates a flurry of notes around whatever chord or groups of notes you’re playing. 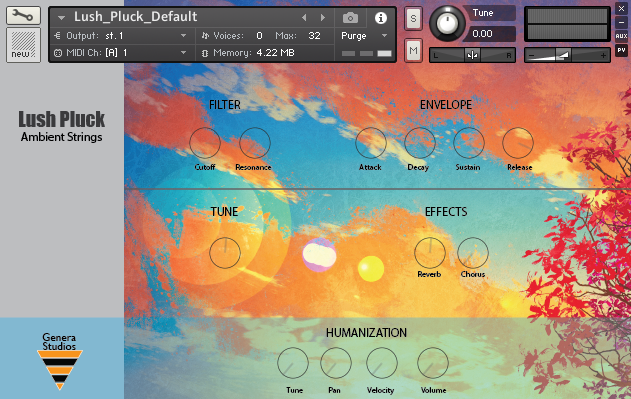 Spooky Chorus comes with 13 snapshot presets to get you started. We found that Spooky Chorus performed best in 3 core areas: the main sounds (resembling a distant choir), the spooky sounds (ghostly artifacts), and fast arpeggiated sounds (to create a wash of sound). Note that if you want to use the snapshots in the drop-down menu on Spooky Chorus, you must move the snapshot folder into your Kontakt snapshot folder. There are instructions for how to do this in the README file included with the download. 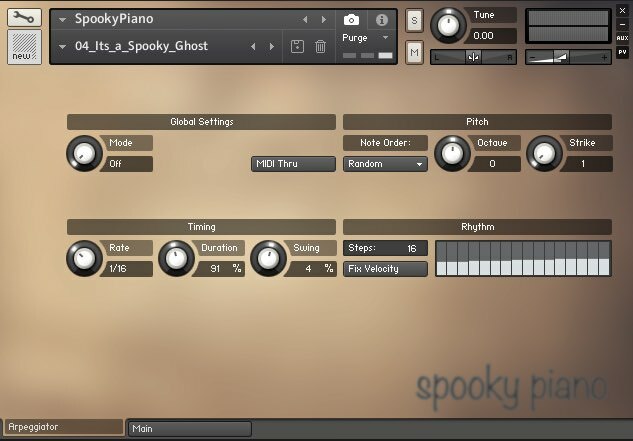 Spooky Piano is Kontakt Instrument created by making convolution IR responses out of notes from a synthesized piano, and then routing noise through each sample to make an atmospheric piano sound. As a second set of sounds, the original samples were then fed through saturation and reverb to create an even more atmospheric sound. As a third set of sounds, a single sample was mapped across the keyboard to create spooky artifacts that add an additional transient to the instrument. The GUI of Spooky Piano was designed to be very graphical. It can be divided into two categories: local and global. The local parameters are made up of 2 XY Pads so the user can graphically place the instrument in both space and frequency. The global parameters are made up of traditional sliders. A second tabbed page gives arpeggiator controls. Our mission with Spooky Piano was to minimize the amount of knobs and sliders without losing any control. The bulk of the UI is made up of 2 XY pads, each containing the 3 unique sounds. You can drag around the sounds on the Volume/Pan Pad to position the instrument in space, and then drag the sounds on the Cutoff/Saturation Pad to position the instrument in frequency content. The remaining sliders control the global parameters of the instrument in a more traditional manner. Spooky Piano comes with a second tab on the GUI that gives you access to an arpeggiator. This is a stock NI preset arpeggiator, but it gives you access to a completely different way to play the instrument. Our favorite mode is random, with the rate set to high speeds – this creates a flurry of notes around whatever chord or groups of notes you’re playing. 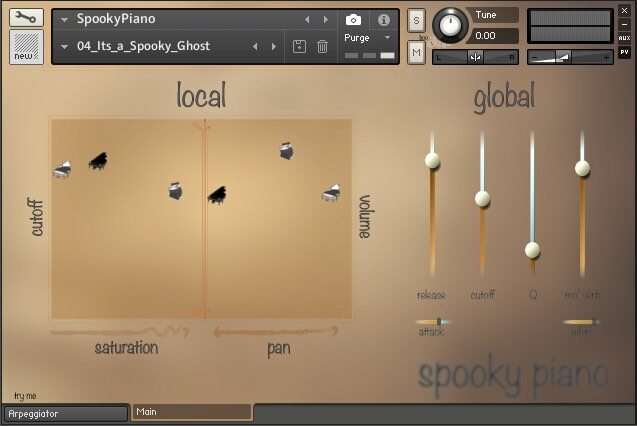 Spooky Piano comes with 16 snapshot presets to get you started. We found that Spooky Piano performed best in 3 core areas: the main sounds (resembling a atmospheric piano), the spooky sounds (twisted sounds barely resembling a piano), and fast arpeggiated sounds. 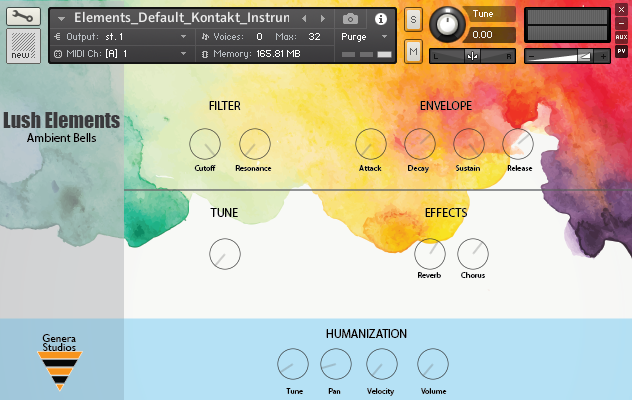 Note that if you want to use the snapshots in the drop-down menu on Taps, you must move the snapshot folder into your Kontakt snapshot folder. There are instructions for how to do this in the (.README) file included with the download. 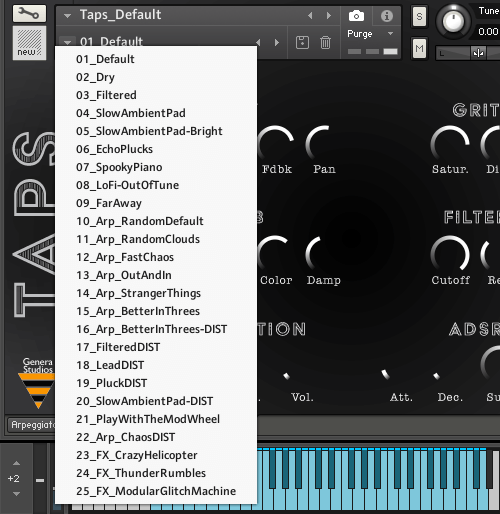 Taps is a Kontakt Guitar Instrument created from tapped notes on a clean electric guitar, with an octave of low open plucked notes on the bottom end. The result is a very playable sample instrument with a diverse sound that can go between chill and ambient to chaotic and heavy. 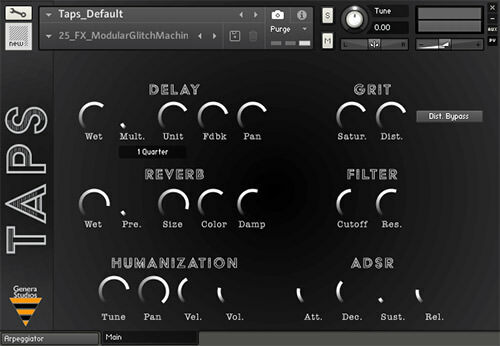 The GUI includes controls for delay, reverb, saturation, distortion, LPF, and ADSR. Theirs also a built in arpeggiator tab. There are 25 snapshot presets included to get you started, but we think you’ll find the possibilities are endless. Our mission with Taps was to create the biggest diversity in sounds possible with the smallest amount of samples. The raw sounds include a bottom octave of low notes played with a pick, and the remaining octaves are tapped notes – all on a clean electric guitar. Through the use of the delay, reverb, grit, filter, humanization, and ADSR modules (and the arpeggiator on the second tab), you can play anything from an ambient pad to a crazy helicopter sound. 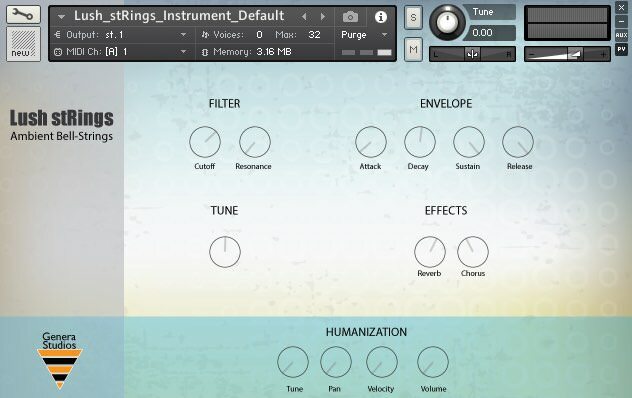 When making a sample instrument you can usually take two distinct paths; deep sampling for realism (many velocity layers and round-robins), or focusing on sound design. We aimed to focus on sound design (deep sampling is often a wasted effort if you’re just going to cover it in delay, reverb, distortion, and filtering). The result was a super efficient 58MB size Kontakt instrument with a ton of capability, that we can afford to offer for a great price. Taps comes with 25 snapshot presets to get you started. The first 9 presets are what we consider ‘standard’ sounds, not too far away from the raw tone of the samples – use these if you want Taps to sound like a clean tapped electric guitar. The remaining presets are a mix of arpeggiated sounds, distorted guitar sounds, and crazy FX. Note that if you want to use the snapshots in the drop-down menu on Taps, you must move the snapshot folder into your Kontakt snapshot folder. There are instructions for how to do this in the README file included with the download. Taps comes with a second tab on the GUI that gives you access to an arpeggiator. This is a stock NI preset arpeggiator, but it gives you access to a completely different way to play the instrument. Our favorite mode is random, with the rate set to high speeds – this creates a flurry of notes around whatever chord or groups of notes you’re playing.